Circus Flora has been a St. Louis tradition for 32 years. Dana Dean discovered they’re juggling a lot of new things this year. At Circus Flora, you’ll find flying people and singing pigs. The act features Lee Kimes AKA Cuzin Grumpy who has been in the spotlight since he was 3. “Show as started in 1956 by my dad. For 62 years, we’ve traveled the country,” he said. 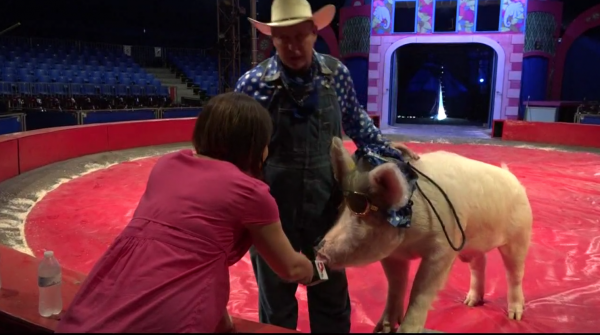 There are 6 pigs who will perform alongside Cuzin Grumpy, Mac the 500 pound pig is one of them. What’s not up for debate is the beauty Rachel Karabenick brings to her performance. “Her apparatus is called dance trapeze but she is also an amazing, strong aerialist and trapeze artist,” Jack said. The name of the show is the Case of the Missing Bellhop. This year, Circus Flora has a new home in Grand Center. “We ventured into a partnership with Kranzberg Arts foundation, who have given us this new permanent home in Grand Center right off of Washington Boulevard,” said Jack.